Many of my Adirondack friends and I choose to celebrate St. Patrick's Day a little differently than the rest of the country. The luck of the Irish seems to work on spring ski conditions as well as for those who claim an Irish heritage. I don't recall how it started, but it has become tradition for my family to ski at Whiteface, the Olympic Mountain, on St. Paddy's Day. Despite our minuscule ethnic link to Ireland, we always seem to get lucky and have incredible weather and outstanding conditions. This year was no exception. 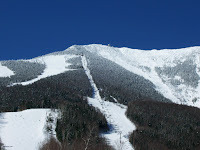 Monday, March 17 at Whiteface was one for the record books. It was clear, blue (Adirondack Blue of course! ), and 32; a stunning day to ski the Olympic Mountain. We skied the entire mountain; lift 6 was open and Skyward was a little hard, but fun. By mid-afternoon break at mid-station, it was warm enough to soak up the sun on the deck and compliment Whiteface Mountain Manager, Jay Rand, on a job well done this season. In his customary humble style, he responded, "Me and a couple of hundred other people..." Here is a link to the photo album documenting another epic day of skiing at Whiteface; St. Patrick's Day 2008. Here's a big "THANK YOU" to my trusty photographer of 27 years!